After putting it to the test, the Emerging Runner Advisory Board has reviewed MixMyGranola, a website that allows customers to custom blend their granola mixes. 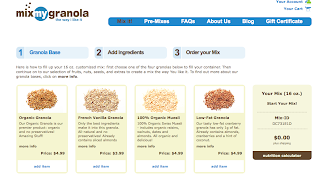 MixMyGranola can be described as Web 2.0 for food. Consumer generated content on the web that you can eat. Interesting yes, but is it a good experience? I took it to the Emerging Running Advisory Board to see what they thought about this product. The raters were me, Sedentary Man and Adventure Girl and our rating criteria were based on quality, taste, freshness and value. You can read the full review here on the Emerging Runner Laboratories product review page. I'm looking to do a couple of training runs this weekend. Last night AG and I had a great run in Central Park after work covering about 3.25 miles. The weather was perfect and there were a lot of people in the park. We hit traffic at spots, between the pedicabs and roving bands of clueless walkers who obstructed the running paths, we had to slow down and even stop for a second at a few points in our run. But we kept a good overall pace and we both felt it it was a great workout. I'm a week away from my next race so I hope to make some progress on speed today and tomorrow. Thanks for this information, I ordered my first mix yesterday. I'm glad to hear we've helped!